The week started out with my 3rd set of half mile repeats, this time I had 6 to run. I decided to go back to the treadmill and was super nervous about it all day leading up to it. My mom emailed me at work for some motivation and encouragement and I knew I could get it done. I didn’t just get it done, I felt like I owned that workout! Incline set to 1.5, warm up/recovery/cool down at 7.5mph and half mile repeats at 8.5mph, 8.6mph, 8.7mph, 8.8mph, 8.9mph, 9.0mph. Tuesday I hopped back on the treadmill for an easy marathon goal pace 3 mile run and dragged Georgie out for 2 miles on Wednesday evening in the dark. We made some stops but I was happy I was able to keep her going for 2 miles. I was supposed to run 3 miles on Wednesday but I knew I would be running 1 mile with a new client at work on Thursday’s rest day. This led to a recovery day on Sunday. No work, no spin, no running. So nice! · Did you hear the news? I’m a BibRave Pro! 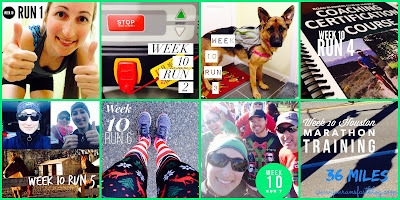 · 6 weeks until the Houston Marathon!